When it comes to capturing music from services like Spotify, YouTube, Amazon Music, Deezer, SoundCloud, Apple Music, and all other legal streaming sources, Audials One is one stop software for all of them. Not just Music, you can also use the software to save movies and series from Netflix, Amazon and other video streams in high quality. While the software is well known, update rolled out on their anniversary, has made it even better. Audials One 2019 offers several new features. Thanks to the new so-called Styles function, users of Audials One 2019 can describe their own musical taste by entering in a few examples of artists or radios, and will then quickly receive vast amounts of fitting music from legal sources. Let’s take a look at their changes. When it comes to Music, Audials has top-notch integration for YouTube, Spotify, and Deezer. 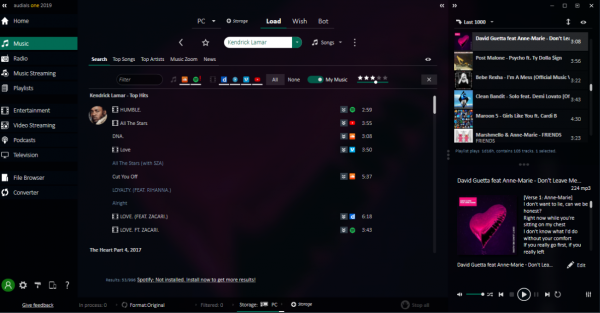 The latest version now offers search through Spotify for the music you want to listen, and save on your computer. Along with this, it makes sure you get the best quality of music, i.e., 320kbit/sec which is now possible with ten times the speed compared to the previous version. Apart from the search, it offers smart pre-settings. It will automatically select the best pre-set depending on the source which could be Spotify software or website or the browser and so on. You cannot ignore YouTube when it comes to music. Audials One 2019 will automatically find the best possible audio tracks to download which keeps up with the quality. You can also directly download the music from videos as an audio track by entering a link. What is interesting to know that the software can automatically take a whole list of YouTube links and Audials will then work through them. This also applies to the new music service YouTube Music. The search experience offers support for Chart, a genre, an artist, a track, or a radio station. Audials then provides you with artists, playlists, compilations, or something similar in the music universe. When it comes to saving Movies & Series from services like Amazon’s Prime, Hulu, NetFlix and so on, Audials does a commendable job. 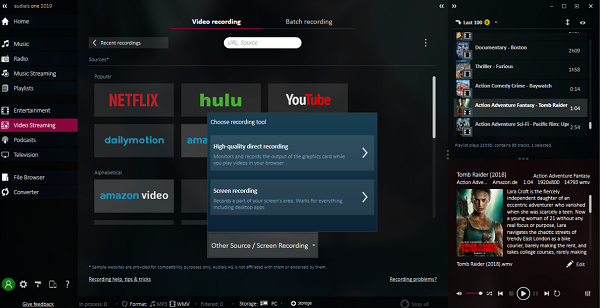 The new update has rolled out better selection where the tile view of the recording configurations that have been predefined for the video streaming services has been redesigned. This makes it low now easier to use with the new image selection. It also offers a list of new services which have been pre-configured for the recording process and can be selected by simply clicking on the right tile. Better Quality When Recording Directly: The software has improved according to the adaptive streaming used by video streaming service these services. It makes sure the artifacts at the transitions between the individual sequences have been minimized. 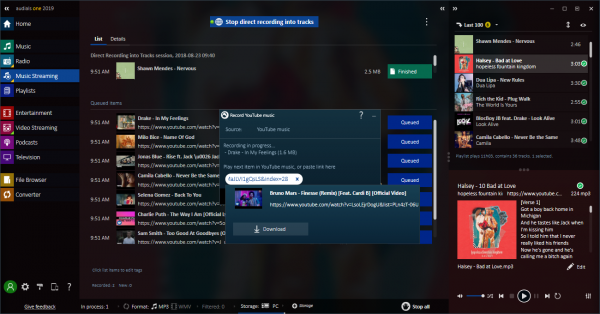 YouTube Direct Download: Supports to download a bunch of links together at best quality. New Mode: This offers high-quality, unscaled recordings directly from the graphics card. Some of the most important video streaming services are preconfigured, while others use a generic model. Cutting-Edge Device Profiles: Support for new device types including smartphone, tablets, and PCs. The best part is that it has been configured for the latest devices as they are released. This means they are optimized on a device basis which is bound to perform better. Personalized: You can create a style simply by selecting a few sample artists or radio stations. Post his when you search for new music, you will be recommended based on your style. Music Bot: Bots are not everywhere, and it’s very smart for a service to have its bot. Once you have set a few parameters on how your music collection should be, the bot takes care of the rest. Once confirmed, Audials will do the rest by finding and downloading the music from YouTube, Soundcloud, Spotify, and internet radio stations. Additional services have been integrated for video streaming. This part of the software has been improved to work on devices with low power. So if you are carrying your Notebook, it’s going to work smoothly on that as well. While doing that you can now enjoy a huge number of new English-language and international live TV streams. A total of 150 live streams with International Live streams is being offered right now. Lastly, if you go full screen, it offers smooth, high-quality television, even on a slower PC. 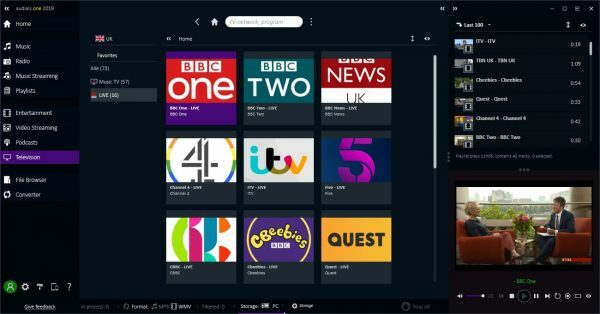 The recording is just one click away, and it also offers support for 50 of the best music TV channels and is relaunching as an integral part of the TV area. When you click on the player’s new recording button, Audials will record the streams in top quality. This allows you, for example, to record sports events from live TV and watch them over and over again at any time. Apart from improving on the content front, a lot has improved with the user interface as well. First, the interface has made sure that one has to go through less click as the options are integrated with the content directly. Right-click and follow the path! This means less time wasted in searching options in toolbars. Second, all music functions are now bundled under the Music Tab instead of available under multiple tabs. Television and Music TV have also been combined. Copy DVD is now available in the Converter. The company has claimed to test the software using different PCs with different capacities and have simulated dozens of scenarios to make sure it works smoothly on any PC. That said, Audials also offers to a record of Online Radios. It offers a massive variety of more than 100,000 online radio stations ranging across 120 genres of music from any country you can imagine and in up to 320 kBit/s. The interesting part of recording from the radio is its ability to avoids adverts and parts where the radio presenters are talking. It can save those with ID3 tags, cover artwork, and even lyrics. What do you think of all the new features in Audials One? Let us know in the comments.